Zenobi, the Balrog-powered indie developer and publisher of wonderful text adventures, is one of my dearest companies ever; it just oozes love and silly humour and whimsy and engrossing adventures. Also, here is a n eBay auction for four Zenobi adventures (ZX Spectrum). 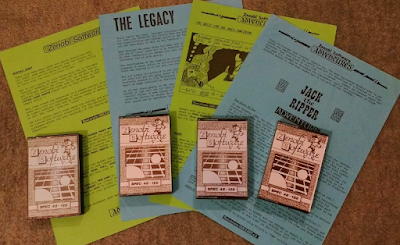 The games are Jack The Ripper, The Legacy, Murder Hunt, and Quest For The Holy Something, and they have all been tested, are working, and come with their original instruction sheets and on their original, fully working tapes.